About a month and a half after my interview at Virtual Tonight by Sam Nightfire, it was someone else’s turn from Second Life Newser. Our new freelancer Xymbers Slade was invited to appear there. Xymbers was the last to appear on the show. Before him were a few others. First were two women from the Cheeky Cow Golf course. Next was noted singer Lance Rembrant. Third was Dmitriy Gauseman from the Tombstone RP area. While the show went on, Xymbers had a problem. A SL glitch was causing the eyes on his anthro wolf avatar to bulge out. So he switched to a “Crux” avatar, hoping for the best with this unusual-looking avatar. As it turned out, Sam liked the Crux, impressed with it’s uncommon appearance. Xymbers was on not to talk about his role at SL Newser, but his fortune telling. He told Sam he had about fifteen years of experience, “I don’t see myself as a psychic ...” He explained what he did as foreseeing potential happenings using tarot cards. 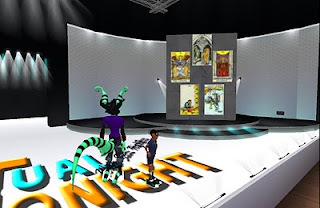 He focused on five cards or ten, usually in Second Life a five card reading. Each card, he explained, has a particular meaning, the final card for example representing if the person didn’t change from his or her course. Sam asked Xymbers if he could do a reading on someone. Xymbers answered he’d need a volunteer from the audience. A boy scout child avatar offered to be the one. Xymbers then rezzed a board, telling the volunteer he needed something to focus on, asking for a location. The boy scout gave his home state, and Xymbers drew the cards. “Just keep doing what you're doing ... I don't foresee anything negative ... don't take any crap from anybody." 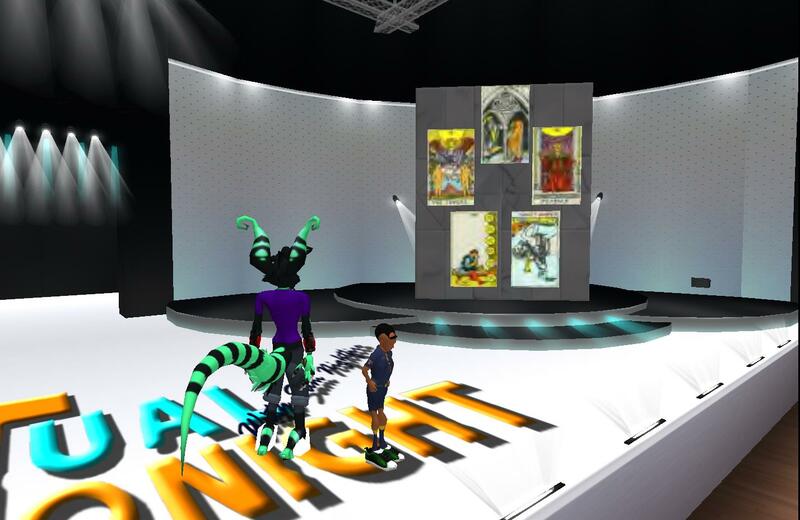 Xymbers went on to say that outside Second Life, he normally does a ten card reading. He could do additional readings, but “do 20 different readings, get 20 different answers,” and asking for more readings to get a better one, he felt, defeated the purpose. The volunteer then admitted to being in a relationship, and thanked Xymbers for the reading. Xymbers did remind him his readings were not a hundred percent accurate. Xymbers later told me this reading was uncommon in that is was unusually positive. Usually his readings had some kind of warning or caution, such as the one he had given me earlier this year. A recording of the interview will soon be available on the Virtual World Network website.